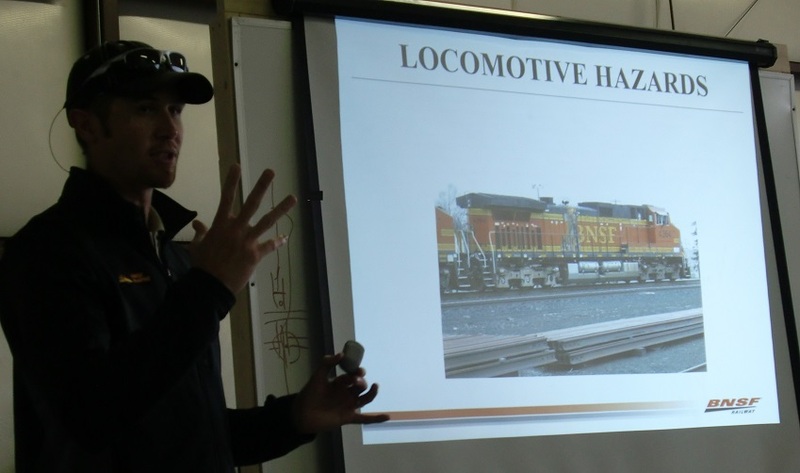 We also learned how to recognize the different kinds of high-pressure and low-pressure tank cars used to transport hazardous materials and to understand the dangers posed by them in a collision or derailment. The good news is that BNSF’s accident rate is low and falling, and new car technology is making railroad cars stronger and safer. Justin even had some props: real safety equipment used on real tank cars. He had hydrant-sized valves inside 3/4-inch-thick steel protective housings the size of a garbage can. This stuff is seriously heavy duty. The class was very well attended by several Blaine police officers, fire fighters, local customs officials, and ACS members. During the breaks, we gave several guided tours of the Comm Van and the Chief provided coffee and doughnuts for all. Thank you Chief, and thank you Justin. FYI, BNSF is a participant in a nationwide safety training network called TRANSCAER. For more information, check out http://www.transcaer.com. Previous PostField Day 2013Next PostBlaine ACS is Hiring!